Specimen of Cyrtograptus, from here. 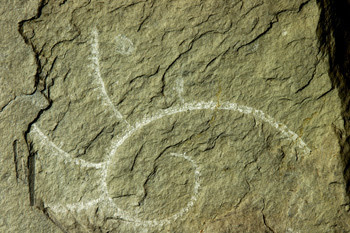 The Cyrtograptinae are a group of uniserial graptolites known from the Middle Silurian, characterised by the regular production of thecal cladia (Bulman 1970). Characters (from Bulman 1970): Main stipe (procladium) generally spirally coiled, helicoidally at proximal end, with one or more thecal cladia, sometimes bearing second- or higher-order cladia; production of cladia typically regular. [B79] Boucot, A. J. 1979. Silurian. In: Robison, R. A., & C. Teichert (eds) Treatise on Invertebrate Paleontology pt A. Introduction. Fossilisation (Taphonomy), Biogeography and Biostratigraphy pp. A167–182. The Geological Society of America, Inc.: Boulder (Colorado), and The University of Kansas: Lawrence (Kansas). [K-D04] Kozłowska-Dawidziuk, A. 2004. Evolution of retiolitid graptolites—a synopsis. Acta Palaeontologica Polonica 49 (4): 505–518.